Everyone will have their own preferred ratio of herbs to grain — western Europeans tend to call mounds of herb-flecked couscous, barely lemony, “tabouli”. I tend to use small amounts of bulgur, or couscous, mainly for texture (this is more typically Lebanese). Cucumber is almost always added, but we usually leave it out, because it makes the whole thing taste cucumbery. Instead, we’ll make one or two separate cucumber dishes, like yogurt-cucumber salad. You can vary the ingredients quite a lot, and turn it into a fantastic main dish. With lentils, or favas (ful medames), you can serve it up with crusty bread, and feta cheese, and it’ll be a perfect lunch on a hot day. Wash the mint and parsley, and remove any tough stems. Finely chop the herbs and green onions (especially the mint and green onions), and put into a big bowl. Chop the tomatoes (and cucumber if using) into small pieces (~1/2 inch, 1cm), and also add to the bowl. This is where it’s important to have a sharp knife, incidentally — or your salad will look like pesto mixed with ketchup. If you’re using any of the optional beans, grains, or seeds, add them to the bowl. Juice the lemons into a bowl or measuring cup (get rid of any errant seeds). Start off with just 1/4 of lemon juice, and reserve the rest of the juice. Add it later, if you want to make it more lemony. Add the salt and black pepper. Whisk together, until the salt is mostly dissolved. Taste — it should be pretty salty. Add the olive oil, and whisk togther a little bit. Pour the dressing over the salad ingredients, stirring all the while. Taste. No one flavour should dominate. Season to taste. Taste again before serving, and re-season (probably a glug of olive oil, and a spritz of lemon will be welcome). This should be served room temperature, or cool (but not cold). It doesn’t take really well to to refrigeration (especially the tomatoes). If you’re preparing it more than a few hours in advance, maybe add the tomatoes right before serving. It’s not terrible served leftover for a couple days, but it’s not great. 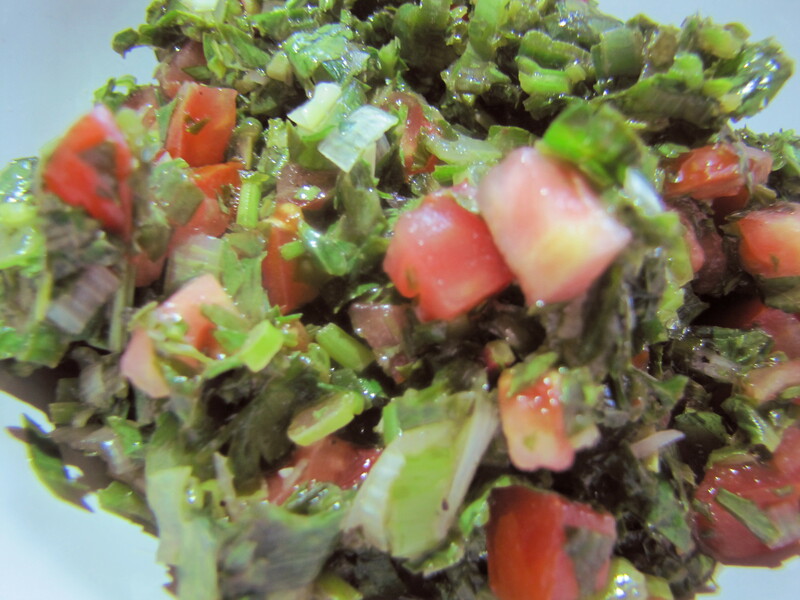 As evidence, the main picture, above, is day-old tabouli, and it’s already starting to look sad.